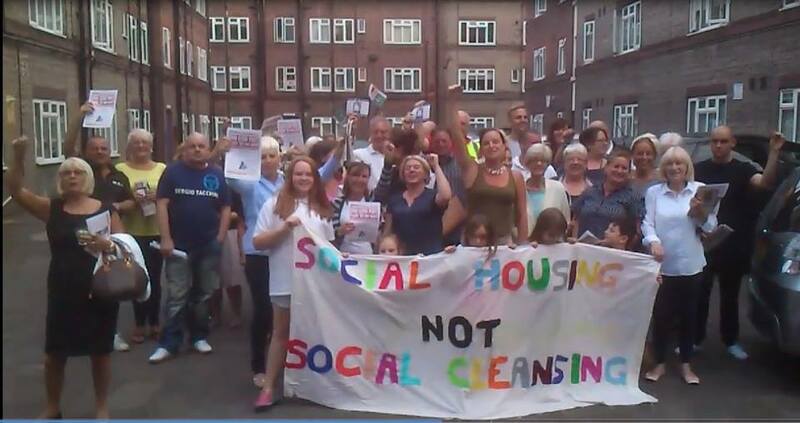 Whilst Richard Benyon has been busy portraying himself in the Huffington Post as some community-spirited Victorian benefactor, the residents who face having to lose their homes as a result of his greed have been getting organised. Multi-millionaire Richard Benyon is the now infamous MP and landlord behind plans to drive up rents on the Hoxton housing estate to exorbitant market levels, effectively forcing out the 89 families who live there, many of them for decades. He is fast becoming the poster boy for the callous social cleansing agenda forcing people from their homes and destroying the communities of inner London. Despite Benyon’s confidence in his popularity among residents, last night they held a meeting on the estate, so packed that people couldn’t fit in the meeting room. Thank you for your recent letter sent to residents of New Era Estate. I’m sure you intended this to be reassuring but the content comes across as patronising and condescending. I am a resident there myself and would like to take issue with your comment that you have secured us a 12 month period of ‘significantly low rent’ in which to ‘review our positions’. A 10% increase in rent from one month to the next, without warning, is unethical and certainly does not constitute ‘significantly low rent’ especially when compared to what we were paying only the week before. Although a 12 month period in which to ‘review our positions’ may seem generous to you, I myself have lived in my current home for the past 16 years and am aware that there are residents who have been here much longer than this. My daughter knows no other home and myself and my family have lived in Hoxton for generations. 12 months in which to ‘review our positions’ which (as I’m sure you are aware) for most of us will mean having to move out of our homes, and probably out of the area, is nothing short of cruel. The 10% increase in our rent which we are now paying will start to pay for improvements to the estate that most of us will not be able to stay and benefit from, which is unfair and again unethical. You may feel that media coverage towards yourself and your family have been ‘hurtful’. How do you feel residents of New Era Estate feel at the prospect of the imminent loss of their homes? Apologies if you do not receive much sympathy from myself and my fellow residents in this instance. Your offer that ‘by working with the local authorities and other key stakeholders we will continue to work with you in every way we can and ensure that you and your families are given the support needed’ should have concluded with ‘to move out of our newly purchased properties’! I appreciate that The Benyon Estate is only a minority shareholder but you are a shareholder none-the-less and have been appointed to ‘manage the estate on an on-going basis’ and therefore cannot disregard your responsibility towards the residents. You may not be ‘directly responsible for setting future levels of rent’ but you will be involved in those decisions and I’m sure will have an awareness of the projected rent increases as part of the company’s business plan but have refused to provide that information to us. You say your family have been landlords in the Hackney are for over 125 years and has become an active member of the local community. Does this activity usually constitute breaking up such local communities and moving residents out of their life-long homes? Please do not patronise us by down-playing and dismissing what is happening here and claiming that you understand what an ‘unsettling time’ time this is for us. Watch out for the New Era 4 All blog where you can sign up to receive updates on their campaign to stay put – coming soon! Tags: gentrification, Insecurity. Bookmark the permalink.